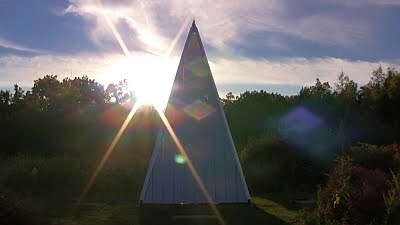 Sun Working Pyramid is the first of our "functional sculptures", where aesthetics is associated to function. 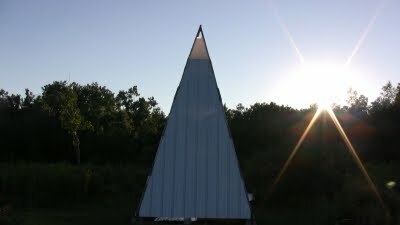 It resembles the Egyptian pyramids, of course not in scale but in the purpose of solar alignments. Sun Working Pyramid is located at the intersection between Noon Columns and Sun Axis. 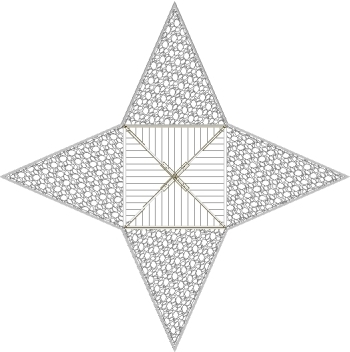 In plan the pyramid faces are aligned to the four cardinal points, north, east, south, west. 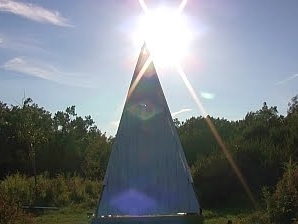 Its elevation can be used as a sundial: the sun apparent path can be traced with the vertex of the pyramid as a reference point. Besides functioning as a sundial, Sun Working Pyramid is also a "container" and used as a toolshed.